This entry was posted in 365 Day Photography Challenge and tagged 365 Photo Challenge, Carl Sandburg, drawing, old friends, paper, pencil, Sam by Cyndi the BookChick. Bookmark the permalink. Cyndi, I’m so happy reading this. The photo is great, especially in that it captures a moment in an interesting way. I’m thrilled you found the time and wil to visit with those old friends. Is Sam an artist, too? I’m slightly manic so I’m a little wordy right now, I apologize. I am always happy when an artist I know and love pursues her or his art. I hope my Meaghan holds onto her dreams, however “impractical” they may be. I didn’t & it’s harder to find the courage to return as an adult! Much love to you, Cyndi. Samantha is far better than I was at her age, however her taste runs to anime and chibi at this point. She wants to learn how to draw faces though, so we have started on those lessons. I think I am going to get her the book Drawing on the Right Side of the Brain – it is a good starter book. Thanks, Eden – the texture of the paper was most cooperative! The detail on the pen is unbelievable!! Thank you, Pablo! 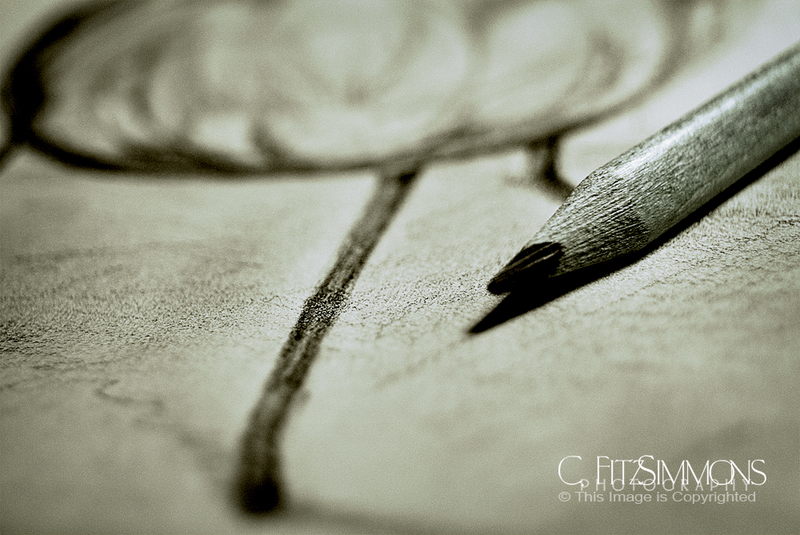 I was trying to choose between this shot and another and decided that the pencil detail was the winner. Ooohh, I would love to see your drawings one of these days, if you don’t mind showing them off. You *know* I am elated to read this! What a special and dear gift to Sam, and to yourself too. And to us, all of us who know what a great thing it is to reconnect with those gifts we have lain aside for a time. So happy! I knew you would be, Kathryn! You were the kick in the seat of my pants on this one, as well as my daughter. Now I am so excited to do a few more scribbles! What was on the paper gave me a good mood – it really was like being with an old friend. o i do love carl sandberg. and i love the humble beauty in you 3B pencil on paper. really and simply lovely. Sandburg is my favorite of them all! Now I need to keep that 3B at work! Your perspective captured the the strength of the pencil, I think. How wonderful that Sam shares your passion and skill. I am tickled that my Sam has such a deep interest in art – I am quite disgusted that she has yet to be scheduled for art class in school – it seems that they schedule students with no interest in those hour blocks! sigh.